These melt in your mouth cookies are the perfect mix of simplicity and deliciousness. 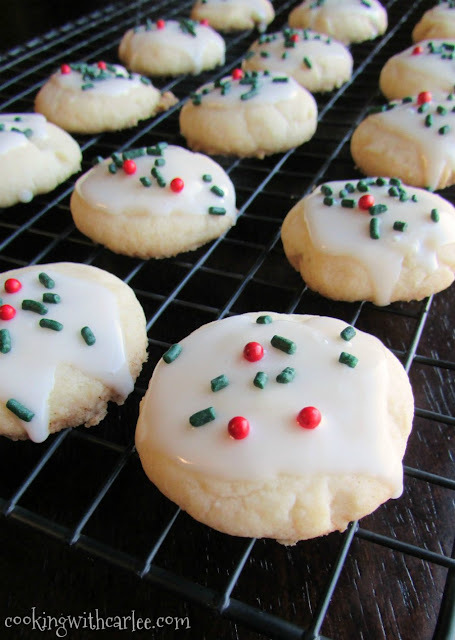 Melting moments are a sure favorite this holiday season! Hasn't 12 days of Cookies been fun so far? There are so many great varieties and inspiration from all around the world. I don't know about you, but I have found plenty of recipes to add to my must make list. If only the holiday baking season were a bit longer and there were a few more hours in the day, I could have the best cookie trays in all of the land filled with a few of each of these marvelous cookies. I suppose there is always next year! These melting moments are a breeze to make. 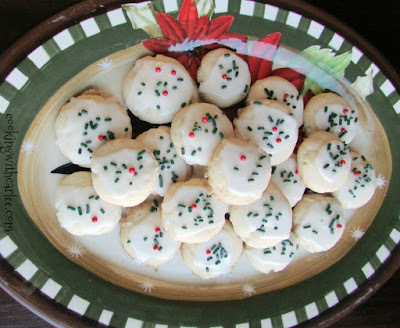 They are a lot like the classic snowball cookies, but without the pecans. You can certainly roll them in powdered sugar if you like, or they are great with a simple powdered sugar glaze and a few sprinkles. You don't have to do anything too fancy to make them stand out. Let their buttery melt in your mouth texture do all of the talking. My little guy LOVED these cookies. He kept picking out his favorites and setting them aside for later. Needless to say none of them hit our trays for sharing. I may have to make another couple of batches when he is napping sometime if we want to have some left to share! So now these are a Christmas favorite at our house. We make a batch along with other new favorites like frostbite cookies and peppermint mocha shortbread cookies. Then throw in a few classics like iced sugar cookies and kolacky. What are some must make Christmas cookies at your house? We're always ready to find new favorites! In a small bowl, whisk together corn starch, flour, baking powder and salt. Mix dry ingredients into butter mixture until thoroughly combined. Roll into 1" balls and flatten slightly. Bake on ungreased cookie sheets for about 12 minutes or until slightly golden. Cool for a couple of minutes on the cookie sheet, then move to a wire rack to cool completely. For glaze, mix together ingredients adjusting with more milk or powdered sugar as necessary to make a thick glaze. Spoon over cookies and top with sprinkles if desired. I have seen so many cookie recipes this week from you and your friends that I want to try for my cookie trays. Add them to the ones that are family favorites and I'll need a truck to store them all in. You could devote a barn to cookies and invite everyone over for a cookie walk! Jax is enough to "melt" my heart...so happy that lil guy loves these cookies...a sweet memory he and you will have forever in relation to these yummy sounding and looking cookies!! Ha! Thanks, Andrea! He melts mine too! These sound so simple and sooooo goooood! I like the way you decorated. Change the colors and they could be for another holiday! Thanks for sharing. I was thinking that myself! They would be an easy addition to the Easter buffet table with some cute springy sprinkles! Thanks, Linda! I love the idea of the glaze instead of rolling in powdered sugar! Love a glazed cookie they're so pretty! These look amazing! Making cookies is on my list of things to do today and I think I'll give these a go! Pinning and thanks for sharing! This is my favorite time of year for baking cookies, I hope you love them! You've been reading my mind...these look fantastic. Can't wait to try them. Printed & pinned! Thanks for sharing with us at Weekend Potluck. Wish I had one right now, oh they look yummy! Thank you for sharing on Merry Monday! Pinned! Have a great week! You'd want at least two! ;-) Thanks! these are the kinds of cookies you keep going back for on a treat plate! Perfect for our celebrate365 cookie exchange! They really are melt in your mouth good. Thanks! I would like to order a dozen please ;) teehee! These cookies look scrumptious! Sure thing! I'll send them your way! These look amazing! Thanks so much for sharing with us at the Happy Holidays Link Party. Pinned. These sound amazing, and I love the little red and green sprinkles on top. So cute! It's amazing the different a few sprinkles make visually! Thanks! I love cookies like these that melt in your mouth! Perfect for the holiday cookie trays! Me too, melt in your mouth is hard to beat! These look delicious. And I bet that if you wanted to take time, you could totally make these look like melted snowman! These look great, so festive with that touch of sprinkles! Such an easy way to give them that little something! These cookies are so festive for Christmas. These sound amazing! I wonder if I can squeeze them in this week! 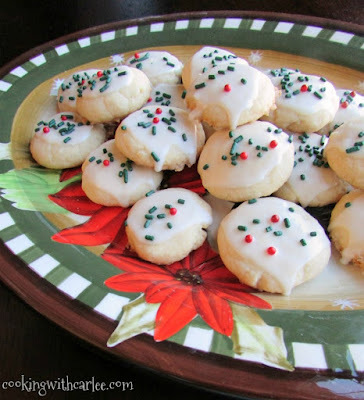 I really wanted to make these this Christmas but I was thrown off by the recipe saying you use 3/4 cup cornstarch. I have never, ever used that much cornstarch in anything. Is that correct? They look really good so I would like to try them. I know, it seems odd, but it is correct. It really helps give them that melt in your mouth texture. I hope you give them a go!